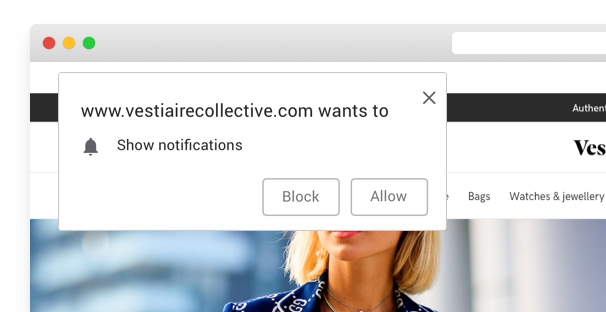 The first thing you need to know is that websites need to obtain an opt-in from their visitors to send them push notifications. Choosing the right format and the right moment to ask for push notification permission is key to build a successful web push strategy. Button: a button you can display in the bottom right or left corner of your website. Native prompt: The native prompt, in case you don't want to use any of the above formats (fully secure mode only). UI Components (except for popup, which is used by the HTTP/Multidomain SDK) are automatically added to your web page once you configure them. Configuring a UI component allows you to override its behaviour, position or even translations. We'll detail what configuration options are supported for every builtin UI Component. When in fully secure mode, you have the possibility of asking for the browser's notification optin directly. A UI Component is required for the HTTP/Multidomain mode, as a click event is required to open a popup without it being caught by browser's builtin blockers. The alert format is similar to popups you can get using alert(). It is not actually modal: the user is still able to interact with the content around it. It can show up in any of the four corners, or can be centered on the top or the bottom of the page. To enable it, add a child object of ui named alert. Where to attach the alert. Should be a mix of top|bottom and left|center|right. Link to a square icon representing your website, which will show up on the left of the banner. The file must be a PNG or JPG image hosted on an HTTPS server. Overrides the text that's displayed in the banner. Color of the banner's background. Color of the banner's text. Overrides the font used in the banner. Works exactly like CSS' font-family attribute. Color of the button's background. Color of the button's text. Color of the button's hover state. Font size of both buttons in px. Do not add the unit to the value. Text override for when the positive button will subscribe the user. Text override for when the positive button will unsubscribe the user. Text override for when the negative button, which hides for popup temporarily, until the delay in `hideFor` has been reached. Style configuration for the positive ("Subscribe"/"Unsubscribe") button. See below for more info about this object. Note: When in unsubcribe mode, this button will always have a red background color. Style configuration for the negative ("Later") button. See below for more info about this object. When closed, do not display the banner again until X seconds elapsed (default: 604800 or 7 days). Use a 0 value to hide the alert forever. Color of the button's background when hovered. Falls back on `backgroundColor` if not specified. Font size in px. Do not specify an unit in this value. Whether this button should cast a shadow, or not. Default: true for the positive button, false for the negative one. The banner shows up at the top of your webpage. It has an optional logo, a colorable button, and can be floating or fixed. To enable it, add a child object of ui named banner. Makes the banner push the webpage's content rather than float on top of it (default: False). Makes the banner show on the bottom of the page, rather than on top. Forces 'fixed' to true (default: False). Text override for when the button will subscribe the user. Text override for when the button will unsubscribe the user. When closed, do not display the banner again until X seconds elapsed (default: 604800 or 7 days). Use a 0 value to hide the banner forever. The Button UI Component shows a simple bell icon in the corner you want which, once clicked, show a pop-in with a customizable opt-in text, and a button to enable notifications. To enable it, add a child object of ui named button. Corner to display the button in. Should be a mix of top|bottom and left|right. Override the text that appears when hovering the button. Color of the button's glyph. Color of the button's background on hover. Color of the button's glyph on hover. title String - Override the pop-in's title. btnSub String - Overrides the pop-in subscribe button text. btnUnsub String - Overrides the pop-in unsubscribe button text. example Object - Example notification to display instead of the placeholder. See 'Theming' for more info. The button theme supports full color customization of the button itself, but not the popin. Just like any other component attribute, just override the wanted value in the configuration object. URL of the image to display on the left of the example notification. In case you don't want to use Batch's formats, you can trigger the native prompt of each browser. That permission request can be shown 3 times a week (more information here). Please note this will only work if you are using the fully secure mode. To enable it, add a child object of ui named native. Time, in seconds. Allows you to set a delay between each display of the native prompt. Starting with Batch SDK 2.0.0, you can programatically control the display of builtin UI components. Note: Most components will be shown as soon as possible. In order to make them wait for your show call, please refer to the configuration of the UI component you're trying to tweak: look for the autoShow key. The user dismissed the UI element, and the minimum time between two dismissal (controlled by the hideFor configuration key) has not been reached.